Friday: Heat 87, Bucks 84 – MASH unit on standby. The Bucks-Heat game at the BC Friday night was injury marred before it started, as the Bucks played without center Andrew Bogut (strained upper back muscle) and the Turkish clutch, Ersan Ilyasova (bad case of the flu). It started ugly, with the Bucks seemingly confused off the opening tap about who was guarding Dwyane Wade. It got uglier in the 2nd quarter when Heat center Jermaine O’Neal hyperextended his right knee driving around Primoz Brezec. Then it got real ugly. Carlos Delfino was knocked to the floor on a drive and then jumped on and stepped on — hard — by Heat forward Udonis Haslem as Haslem rebounded the miss. Delfino’s neck absorbed most of the impact of the off-balance Haslem’s weight, and he lay motionless for nearly 8 minutes before being carted off the floor on a stretcher and taken to the hospital for X-rays. The lowlight reel looks like an episode of M*A*S*H. Or Rollerball meets M*A*S*H.
Carlos Delfino: At St. Luke’s Hospital with pain in his neck and jaw, undergoing X-rays. Should be resting for at least a couple of days. Ersan Ilyasova: Received IV fluids in an attempt to clear out a bad flu bug and play against Miami but had to sit out the game. Delfino received IV treatments about a week ago for the same, so the bug is apparently making its way around the Bucks locker room. This may or may not explain some of the Bucks sluggishness of late (I’m remembering the 3-9 start on the Bucks last 50-game winner, 2001; a team-wide flu bug may have calmed coach George Karl’s ire, maybe a little). Better now than in the playoffs. Jerry Stackhouse: No, there’s nothing wrong with his shooting arm, it’s just Stack being Stack. 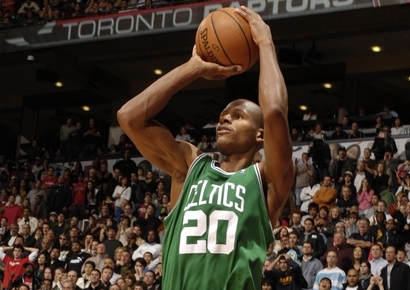 Against the Heat, Stackhouse shot 2-10 from the floor, sinking his shooting % over his last 10 games to 31.1%. He missed all three of his attempts from downtown, dropping his 3-ball success rate in his last 10 to 22.5%. The so-called “spark” is gone, GM John Hammond, but that’s nothing that Dallas Mavs fans couldn’t have told you about 35-year-old Stack before you signed him. The Bucks as a team are shooting poorly from 3-point-land and shooting too many of them in these last two losses. It’s too easy to create the obvious nicknames out of Stack’s name to highlight the problem, so let’s just say that Jerry’s not helping. Why isn’t my blog as good as Ball Don’t Lie? I try guys, I really do. Sometimes not as hard as I could, but check this out: Highlights of Charles Barkley broadcasting the Heat blowout of the Bulls Thursday. I was watching Tennessee-Ohio State that night, sorry to admit. A lineup change for Memphis on Sunday? : Here’s hoping that Skiles puts Charlie Bell back in the starting lineup while Delfino is recuperating. Although Bell bottled up Wade twice in three days Jan. 30 – Feb. 1 — prompting Brandon Jennings to say that it looked like the Bucks had “a D-Wade stopper” — Charlie started the game on the bench and didn’t play until Delfino went down. Bell had another “stopper” game in Nov. against the Grizzlies’ O.J. Mayo, harrassing last year’s ROY runner-up into a 6-18 shooting night (15 pts) while scoring 19 himself in the Bucks win. The Bucks won in Memphis without Bogut and Luc Mbah a Moute, who stayed in Milwaukee recovering from early season injuries (Michael Redd joined the team on its 4-game road trip after the Memphis game). Skiles may have signalled some regret about not starting Charlie on Wade, finding it kinda remarkable that his starting defenders couldn’t keep track of one of the game’s best players on the opening tip possession, a reverse layup by Wade. “We had two guys with their backs to the play, and another guy just standing there watching,” Skiles griped in post-game interviews. Not having Bogut in the paint to anchor the defense didn’t help matters Friday, but if nothing else, CB would have clung to Wade like a cop short on a ticket quota (hey, it’s better than the first simile I came up with). And he’s a better 3-point shooter than the Bucks who’ve been bricking it up from the Land of Ray and Reggie as if their career shooting percentages say it’s a good idea (note that John Salmons‘ shooting numbers say that it is a good idea for him to be shooting from downtown). East Playoff positioning: The Heat’s (39-34) win in Milwaukee pulled them within two games of the Bucks (39-32) on the loss side, and the Bobcats (38-34) beat the Wiz in Charlotte to keep pace. While the Bucks have the tie-breaker against the Heat (3-1) and a 2-1 edge on the ‘Cats, they also have the toughest remaining schedule, not a bad thing considering that the prize for finishing in 5th place in the East could be a first round matchup with the Celtics. The first round opponent could well be the Hawks, too, but winning 5th does come with one certainty — it puts the lucky winner in the Cavs’ bracket for the semifinals. Optimal for the Bucks (and for the Cats and Heat) is 6th place, a first round matchup with the Hawks at #3, with the Orlando Magic to look forward to in the semis. Let’s take a look around the East to see where the still-positioning teams are at, something I used to do regularly in these Bucks Weekends but got away from for one reason or another, probably not good ones. Boston Celtics: Beat the Kings easily Friday in Boston but the rest of their 5-game homestand looks like a made-for-TV ratings push by the NBA. In fact, that’s what it is: the Spurs, Kevin Durant and the Thunder, the Rockets (who’ll be watching on Final Four night, anyway?) and a Sunday marquee vs. the Lebrons. The Celtics are healthy and playing well, casting aside a lot of premature speculation that they’re finished. Not these guys. The Bucks can’t play much better than they did in beating the C’s in Milwaukee March 9, and it still took some good defense by Bogut (on Paul Pierce) on the last possession to secure the win. The Celtics have become more focused since then. But it seems many NBA observers, and Bucks fans too, are mistaking the Celtics more lax, health conscious 2010 regular season approach as a sign of weakness. Maybe it is. They know they’re not Dwight Howard’s age anymore. But even without KG, Ray and Rondo and a tired Pierce were a tougher out for the Magic in 2009 than the Cavs. The C’s have a two game cushion on the Hawks but a schedule tough enough to make things interesting, including two games vs. the Bucks. The Celtics could drop to 4th and the Bucks could be the team that puts them there and sets up a Milwaukee-Boston matchup in Round 1. 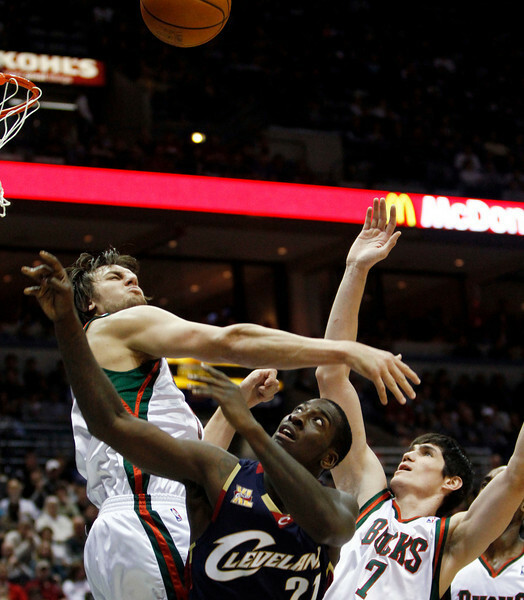 Although Andrew Bogut plays inspired ball against the Celtics big men, trust me — the Bucks match up much better against the Hawks. Atlanta Hawks: Lost in Philly to the Sixers, who apparently don’t realize that they’re sacrificing lottery pings with every win. The Hawks fell to 17-19 on the road, as big a reason as there is for the Bucks, Heat and ‘Cats to prefer the Hawks over the Celtics in Round 1. Reason #2 is the Hawks mediocre, 13th-ranked defense. Number 3 is point guard Mike Bibby, a good-shooting veteran, but no Rajon Rondo, whose rabid intensity gets old quick. The Bucks get away with playing a lot of Luke Ridnour against the Hawks, something Skiles does to keep Lucky Luke’s shooting on the floor. That doesn’t fly against the Celtics, who tend to treat Ridnour like a pinball. 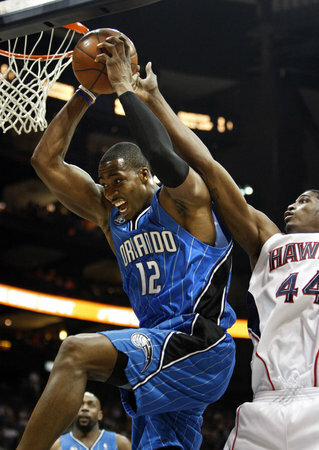 That’s right, I’m calling the Hawks soft, apologies to Josh Smith. Three of the Hawks’ remaining 10 games are as tough as they get: home and home against the Cavs, and a game in Atlanta vs. the Lakers. The Hawks best chance at 3rd is to win on the road in Milwaukee and Charlotte, and hope the Bucks can help them out in two games vs. KG, Ray, Pierce and Rondo. The Hawks are a game behind the Celtics on the loss side and the Celtics own the tie-breaker as Atlantic Division champs. Miami Heat: Dwyane Wade missed a few games last month but is back with a vengeance, determined to make his teammates better on this playoff run. “I’m just trying to be a team player,” he said in Milwaukee, as if to say his Heat don’t have a chance of winning a playoff series if his young teammates don’t learn to share the burden. Michael Beasley, he’s talking about you becoming a star. And Wade is right — he’s largely responsible for Beasley’s development and success, for now. (It’s a good thing for the rest of the NBA that Kobe Bryant doesn’t share those sentiments about his Lakers.) Looming on the horizon are free agent possibilities that say this could be Wade’s last season in Miami, though right now that’s not nearly as important as center Jermaine O’Neal’s hyperextended right knee (a Bucks-Heat casualty Friday). Wade and Miami have nine games left and the 8th place Raptors are the only opponent on it not bound for the lottery. The Heat just might win out and box the Bucks down to 6th. Charlotte Bobcats: Larry Brown‘s team is currently 2nd in NBA defensive rating (points allowed per 100 possessions), and did I mention this is a Larry Brown team? The ‘Cats are in the middle of a five-game homestand filled with lottery opponents until game 5 next Friday vs. the Bucks, when the season tie-breaker is on the line. Shooting guard Stephen Jackson‘s been red hot lately, All-Star Gerald Wallace continues to play like one and has become one of the more efficient scorers and best defenders in the East. Center Tyson Chandler is finally back from injury for the playoff run but Brown continues to start ex-Sixer Theo Ratliff, which is weird like all things related to the Sixers. I still can’t believe Brown traded one of his favorite 2001 Sixer defensive pests, Raja Bell to Golden State for Jackson. But then, Bell was hurt and the Cats are seeking their first playoff appearance in franchise history, something Brown and owner Michael Jordan really, really want. And Nellie would have given them Jackson if NBA trade rules allowed it. If the ‘Cats lose to the Bucks April 2, it’s a two-game setback and will likely banish Charlotte to the 7th spot and a Round 1 matchup with Howard and the Magic. Toronto Raptors: Hello Cleveland. Goodbye Chris Bosh. This entry was posted in The Jinx and tagged Andrew Bogut, Atlanta Hawks, Boston Celtics, Carlos Delfino, Charlie Bell, Charlotte Bobcats, Dwyane Wade, Ersan Ilyasova, Jermaine O'Neal, Jerry Stackhouse, Larry Brown, Memphis Grizzlies, Miami Heat, Michael Beasley, Mike Bibby, O.J. Mayo, Rajon Rondo, Scott Skiles, Theo Ratliff, Tyson Chandler on March 27, 2010 by J.D. Mo.